As a poet, playwright, and activist, Haitian writer Félix Morisseau-Leroy’s (1912–1998) persistent aim was to elevate the voice of his people — full of tragedy as well as resplendence — in all its facets and contradictions. Hailed as the “voice of Haiti” during his own lifetime, Morisseau-Leroy’s iconic status among the Haitian and diaspora community rests on his outspoken courage and pioneering legacy in Haitian literature. Known simply as “Moriso” in Creole, Morisseau-Leroy is revered as a leading figure in Haiti’s Creole Renaissance during the 1950s. His 1953 poetry collection Dyakout broke convention by presenting Creole writing, the language of the common Haitian people, as art. His stage play Antigòn an Kreyòl, a similarly groundbreaking translation of a classic Greek tragedy set in a Haitian cultural and religious context, was received triumphantly in Port-au-Prince that same year. It was the success of Antigòn that first propelled Morisseau onto an international stage. To publish and stage Creole during the 1950s, as Morisseau did, was an inherently political act. Haitian Creole was the true language of some 90 percent of the country’s population, as it remains today. At that time, however, the Haitian Republic’s sole official language was French—a vestige of its colonial past. Critics derided Creole as less than a language, an impure pidgin that kept Haiti backward-looking. Morisseau, on the other hand, strove to show its rich capacity for expressing the range of human intellect and emotion. In addition to championing Creole literature, Morisseau believed ardently that the language must be legitimized officially, advocating for its adoption in Haiti’s educational system. Later in the decade, when the repressive regime of US-backed President François “Papa Doc” Duvalier began tightening its grip on power through notoriously cruel methods, Morisseau perceived that his overt free speech was no longer welcome in his home country. 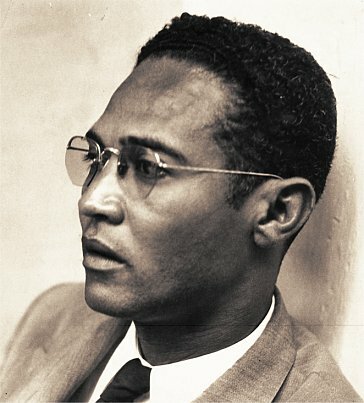 In 1959, Morisseau went into exile. Despite his canonical status within Haitian literature, Morisseau remains almost unknown to English-speaking audiences. A landmark for Creole poetry in English, the anthology Open Gate (2001), edited by Paul Laraque and Jack Hirschman, reverently opens with several of his poems in translation. Now out of print, Haitiad & Oddities (1991), edited by Jeffrey Knapp, first introduced English translations of Morisseau’s poems including some earlier works in French. Examining Morisseau’s life and work today, we may still hear, in brilliant lucidity, the voice of the people for whom the writer considered himself a mere scribe. Today, one-dimensional images of Haiti and Haitians abound in headlines, and stereotypes perpetuate. This artist’s writing offers, in contrast, a multifaceted encounter with Haitian experience, invoking a vivid sense of humanity all too often overlooked. This profound humanity is exemplified throughout Morisseau-Leroy’s work, including texts written before his decisive turn to Creole. One early poem, Natif-Natal, reveals a particularly expansive, unifying interpretation of shared Haitian experience. Written in 1948 in French, the poem predates Morisseau’s definitive turn to Creole, remaining accessible to a global readership. Literally translated “Native-born,” Natif-Natal elegantly weaves together ruminations on Haiti’s history, spirituality, and national psyche. The story-poem registers a period of popular upheaval in Haiti, the 1946 strike and demonstrations in Port-au-Prince and other parts of Haiti known as the Cinq Glorieuses. While this student and labor action failed to revolutionize Haitian society as its instigators sought, its fallout nevertheless brought profound changes to the country. The poem evokes the reverberating rhythms of Vodou drums, conjuring a vision of social transformation and healing of national trauma. This glimpse of optimism encapsulates the spirit of the Cinq Glorieuses, inflected with the author’s own defiant aspirations for his people’s future. Among this gentle lapping of waves, birth and death mingle. The cadence at ease, nature’s cruelty in this vision of Haiti is minded with indifference; its people reconciled with life’s duality out of intimate necessity. This primacy of Vodou imagery held fresh potency in the wake of the Cinq Glorieuses. A forcefully repressive “anti-superstitious campaign” in the preceding years precipitated the social upheavals of 1946. This campaign of religious suppression was instigated by Catholic clergy and supported by the government. As with the stigma attached to the Creole language, prejudice against Vodou among the powerful undermined an African-rooted tradition popular among Haiti’s Black majority. Each represented a facet of a repressive social stratification that permeated Haitian cultural life, economics, and politics—all to the benefit of the nation’s small, predominantly mixed-race elite. Descending from the French colonial overlords and their Black wives and mistresses, this elite class inherited the former colony’s sugarcane wealth. Having dominated Haitian trade and government since the country’s independence in 1804, their supposed cultural superiority was wielded as a tool to help maintain the uneven status quo. The attempted Vodou suppression of the early forties coincided with an ill-fated agricultural scheme, backed by the United States, to meet wartime demand for rubber at plantation scale. Across swathes of the island’s interior, Haiti’s acquiescent government evicted smallholding peasant farmers from their homes. Both efforts to cajole Haiti’s Black peasantry underestimated the hold of African-rooted life-ways, compounding popular grievances. “All that’s happened” to Haiti throughout the country’s history is evoked explicitly. From “a forest of masts” to slave ships’ “black-out holds,” to the burning of the landscape with “the hot-iron of a road” — a scar of mandatory Black corvée labor inflicted under the watchful eye of U.S. Marines — striking images of bitter cruelty outline grievances with a deeper history. Though subtle, allusions to U.S. hegemony within the Western world are unmistakable. Haiti’s relationship to Western powers, after all, is marked by imbalanced antagonism. French recognition of Haiti’s independence had to be purchased; national debt repayments siphoned off the fruits of Haitian labor up until 1947. The United States would not recognize this fellow liberated colony’s independence until 1862. With Haitian paranoia gripping the American South, the Civil War had to be settled before Washington D.C. could acknowledge a Black state’s self-determination. Morisseau himself grew up during U.S. occupation (1917–1934) in Haiti. He witnessed firsthand the U.S.-Marine practice of mandatory labor for public works remembered as corvée. The specter of Haitian history ever-present, the irony of armed white foreigners overseeing mandatory Black labor was not lost on the young student. In light of this background, Natif-Natal levels a charge of hypocrisy against not only the “obscurantism” of Christian faith but against Western civilization as a whole. Seen as two parts of an entwined ideology that preaches progress, in practice they insist on indifference. For some of mankind, it seems, earthly salvation may be delayed eternally. Again and again, the oar-beat of Natif-Natal’s dominant rhythm persistently urges onward in a search for an authentic truth, some source of redemption actually worthy of trust. “Do not confuse music with song,” the poem warns: for song implies words, still irrecoverably logical. A vestige of civilization, ratiocination is rebuked. Where then does the poem locate the potential for redemption? In that which, “without the drum, the world would ignore.” Natif-Natal vaunts human intuition—spiritual, intimately connected to nature, rooted in something more primal—which it finds embodied in the folk art of dance. one has so loved the joy and pain combined . . . The harvest prophesied in Natif-Natal did not come to twentieth-century Haiti. Living in exile during nearly three decades of the devastating Duvalier dictatorship, Morisseau’s works became clandestine in his home country. He spent many years in Ghana and later Senegal, working in solidarity to nurture national theater initiatives in post-independence Africa. He published three subsequent volumes of Creole poetry, titled Dyakout 2, 3, and 4. Meanwhile, between 1977 and 1981, some 60,000 Haitians had fled their home country, coming in boats to Florida seeking asylum from the persecution and deteriorating conditions of the Duvalier regime. In his later life, Morisseau moved to Miami himself, reuniting with his family. No stranger to American hypocrisy, Morisseau worked to confront anti-refugee sentiment that arose in that time despite the United States’ own role in Haiti’s political problems. Through tireless protests, public speaking, and poems like the defiant “Boat People,” Morisseau championed Haitian-Americans’ interests to combat the prejudice they met Stateside. As time passed, he became an elder statesman of the refugee community in south Florida. One 1996 profile in the Miami New Times, written after the fall of the Duvaliers, describes Morisseau’s “high cloud of stiff white hair” and “pale, almost translucent pupils” giving “a mystical countenance, like that of a tribal wise man incarnating sacred spirits.” The article captures the flurry of optimism toward Haiti during the new administration of President Jean-Bertrand Aristide, with the refugee crisis subsiding. Its author tells how, in the dictatorship’s aftermath, Morisseau was finally able to visit his native country again. In 1991, he even spoke at Aristide’s inauguration. In turn, Aristide affirmed the writer’s lifelong cause, naming Creole an official language of Haiti. That profile’s author managed to capture something else in that piece, something rarely achieved in writing: Morisseau’s laugh. It is a full laugh, bottom-bellied, spontaneous, and uninhibited. It is no different from the “seditious laughter” of Natif-Natal. The profile’s title reverently echoes Morisseau’s laurel-crowning as “The Voice of Haiti,” and aptly so. This resilient, “fertile laughter” in the face of overwhelming tragedy — in stubborn resistance to such tragedy — is the truth Morisseau’s life and work give voice to today. Here is the love of “joy and pain combined” which he situated at the heart of Haitian experience; a defiantly optimistic embrace of life made all the more sinuous for its intimacy with anguish. Grasping that joy, that unruly laughter in the face of despair, is the glimmer of understanding Morisseau offers. If it points to something distinguishably true of Haiti, it also indicates a height of potential within the human spirit—one that Haiti’s stories can exemplify for the rest of the world. “Everything I have done,” Morisseau confided to his interviewer toward the end of his life, “I have done by the power of my bravado.” He remained a fierce critic of U.S. foreign policy, a consummate defender of freedom, and a voice of the people until his passing in September 1998. Jared Spears is an essayist based in New York City. His writing navigates the intersections of history, culture, and public discourse, and has recently appeared on Lit Hub, Jacobin, Smart Set, and in Philosophy Now. The research on Morisseau-Leroy and mid-century Haiti presented here was undertaken in part at the Schomburg Center for Research in Black Culture in Harlem, New York.